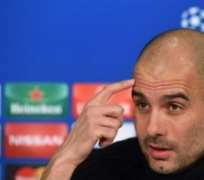 Bayern Munich coach Pep Guardiola has defended himself against the criticism he’s received for his team’s defeat to Atletico Madrid in their Champions League semi-final first leg, adamant he can still turn things around . The Bavarians face Borussia Monchengladbach on Saturday with the opportunity to win the Bundesliga title, but all talk has been on Wednesday’s loss to Diego Simeone’s men. The coach also went on to justify why Thomas Muller didn’t start the match and how his tactics dictated his team selection. The former Barcelona boss believes that it is too premature to rule his side out, even though Atletico beat Barcelona in his final season at the Camp Nou.